WWhat is Gluten and where is it found? What is Gluten and how to identify it? Gluten is a mixture of proteins found in wheat , and rye, barley and triticale. Gluten helps foods maintain their shape, acting as a glue that holds food together. The gluten protein complex accounts for 75 to 85% of the total protein in bread wheat. It is conjoined with starch in the endosperm of various grass- related grains. Gluten proteins are termed prolamins. 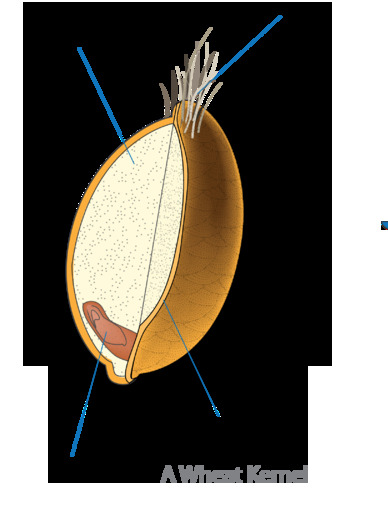 It is a protein that is attached to starch in the endosperm of various grass-related grains. Wheat prolamins are called gliadins and glutenins, barley prolamins are hordeins, rye prolamins are secalins and oats prolamins are avenins. What is the structure of gluten (prolamins) protein? Prolamins are a group of plant storage proteins found in the seeds of cereal grains: wheat (gliadin), barley (hordein), rye (secalin), corn (zein), sorghum (kafirin) and as a minor protein, avenin in oats. They are characterised by a high glutamine and proline content and are generally soluble only in strong alcohol solutions. Some prolamins, notably gliadin, may induce celiac disease in genetically predisposed individuals. Wheat gliadin protein region - amino acids 43-49- showing high proline presence. See also:The structure and properties of gluten: an elastic protein from wheat grain. Why are Proline rich proteins are hard to digest? In normal digestion long strands of protein are broken down by digestive enzymes. 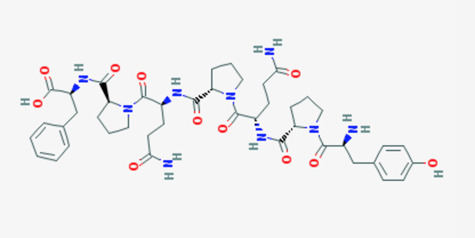 The enzymes cleave or break off groups of amino acids called peptides. The majority of these peptides can be further broken down, absorbed through the intestine and then transported and used in the body. Proline and glutamine, however, are two amino acids that are difficult to digest. Neither proline nor glutamine are classified as essential amino acids. It is the high proline and glutamine content in gluten that prevents the proteins from being completely broken down by the digestive enzymes. The long-term result of this is that toxic oligopeptides, proteins with up to ten amino acids, are present in the small intestine. Proline is degraded using an oxidase, which converts proline into glutamic acid using glutamate-gamma-semialdehyde. The glutamic acid in turn must be converted into glutamine, so that it can be transported to the brain, where it is necessary for protein synthesis. How is gluten recognized by the immune system? Coeliac disease, the most common intestinal disorder of western populations, is an autoimmune enteropathy caused by an abnormal immune response to dietary gluten peptides that occurs in genetically susceptible individuals carrying the HLA-DQ2 or -DQ8 haplotype. Despite the recent progresses in understanding the molecular mechanisms of mucosal lesions, it remains unknown how increased amounts of gluten peptides can enter the intestinal mucosa to initiate the inflammatory cascade. Current knowledge indicates that different gluten peptides are involved in the disease process in a different manner, some fragments being ‘toxic’ and others ‘immunogenic’. Those defined as ‘toxic’ are able to induce mucosal damage either when added in culture to duodenal endoscopic biopsy or when administered in vivo, while those defined as ‘immunogenic’ are able to specifically stimulate HLA-DQ2- or DQ8-restricted T cell clones isolated from jejunal mucosa or peripheral blood of coeliac patients. These peptides are able to trigger two immunological pathways: one is thought to be a rapid effect on the epithelium that involves the innate immune response and the other represents the adaptive immune response involving CD4+ T cells in the lamina propria that recognize gluten epitopes processed and presented by antigen presenting cells. These findings are the subject of the present review. Does corn have gluten? Is corn alright to eat if you are gluten sensitive? Corn is a type of grain, but it's from a different branch of the grain family than the gluten grains wheat, barley and rye. 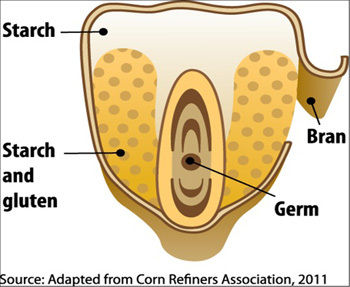 Corn contains a substance known as "corn gluten," which sounds problematic for gluten sensitive people, but corn gluten isn't the same that affets people with celiac or gluten sensitivity. 2- The structure and properties of gluten: an elastic protein from wheat grain.